If your hernia is painful or you cannot get it to go inside again.....see urgent footnote immediately! A hernia is formed when the contents of a cavity in your body pout out through a weakness or hole in the wall that would normally keep it in. 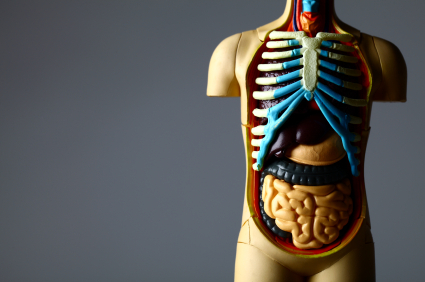 Some hernias form obvious swellings on the outside of your body, others are hidden internally. Once they have formed it is difficult to get rid of them without help. The best approach is to avoid them all in the first place. Some people are born with weaknesses or holes already formed, where their bodies have failed to close gaps necessarily present before birth. Preventing the most serious of these conditions depends on careful preparation for pregnancy; happily they are rare. Most hernias come on later in life because of abnormal pressure against a weak muscle, and most of these result from straining of some kind. These are the ones you need to understand and can prevent. Think for a moment of a bicycle tyre and inner tube. You can pump up the air in the inner tube to quite a high pressure provided that the tyre is strong all round it; but if there is a small hole or crack this begins to give way as the pressure rises. At first it shows only as a slight swelling, but there comes a moment when the remaining strength of the inner tube is overcome and a balloon of it suddenly blows up through the hole, weakening rapidly as it enlarges. Hernias form in very much the same way. Nagging pressure every day at first only marks out a weak point, but any pouting at that point tends to emphasise the weakness a little. One day an exceptional exertion blows it out quite suddenly and an obvious swelling is formed. In your body this does not usually burst as a bicycle tyre would, but on the other hand it will not go away, either. You may be able to push it in with your fingers, even keep it in with a truss of some kind; but it is never likely to seal up again by itself. The best known are hernias in the groin, which take advantage of the existence on each side of your groin of a slanting passageway that leads out of your belly cavity downwards and inwards towards your crutch. In males it contains the sperm cord from the testicle on that side, and is the route by which the testicle descended into the scrotum in the first place. Little boys are sometimes born with one or both of these passages still open as a result of minor delays in their development, but most hernias in both sexes form later in life as a result of straining. That in turn usually happens because of some degree of constipation, or else bad lifting technique. Once they have formed the only effective treatment is surgery, but you have also to correct the bad habit that caused the hernia to form or there is every chance you will get another! The commonest hernia in childhood is a small bubble near the umbilicus or navel, where the muscle of your abdomen has not yet closed properly around where your cord was cut at birth. This umbilical hernia is one that does usually close all by itself, sometime in the first nine months of life. Exceptionally, surgery may be necessary. However the same weakness may recur and form a hernia during a pregnancy much later in life; in that case, repair is needed more often, best after all your pregnancies are complete. Surgeons are careful to avoid weakening muscles when they have to cut through them, but sometimes they fail. Consequently a hernia may form at or near the operation scar and is known as an incisional hernia. This one has you in Catch 22: any attempt to repair it may actually make it worse. However an incisional hernia exactly up the middle of your stomach, or wide separation of the big strap muscles that run down either side of your mid line, can usually be corrected. The last common form of hernia is hidden inside the top of your belly where it is divided from your chest by your diaphragm. Your gullet or food-pipe has to pass through the diaphragm on its way to the top of your stomach, and sometimes that hole in your diaphragm gets stretched and weak. A bag of your stomach can then slide up through the hole alongside your food-pipe, forming a hiatus hernia. This makes it too easy for the sour juice in your stomach to wash back into your food-pipe — reflux. If the juice burns the skin of your food-pipe you feel this as heartburn. 1. Good lifting technique: Learn to lift without straining. If your job involves heavy lifting learn to use only the muscles of your arms and legs, with a straight back. You cannot strain unless you hold your breath, so let your breath flow freely while you make any effort. It comes with practice. 2. Regular bowel emptying: When your bowel signals to you that it is full, go straight away and empty it. That way you will never have to strain — your bowel muscle will do all the work. In any case cover your groins with your thighs to protect them from pressure, if necessary by placing your feet on a small platform on either side of the toilet pedestal — which is, incidentally, very poorly designed from this point of view. 3. Avoid restrictive clothing: If you are overweight do not try to pack your embarrassing extra flesh behind a corset or tight belt — you make your chances of a hiatus hernia much worse. 4. Lose weight: Incisional, umbilical and hiatus hernias always improve dramatically if you can lose enough weight, but this may add up to several stones. You need to get to the point where your belly is hollow again — even if by now it is more pear-shaped than it used to be! 5. Digestive health: Hiatus hernia is less troublesome if you avoid eating much meat, since you then make less acid. Do not eat shortly before bedtime and never eat a large or rich meal in the evening. You may need to sleep propped up in bed on several pillows. Tablets or liquids that form a foam to block the food-pipe at the top of your stomach only work if it is actually uppermost. If you already have a hernia and one day you cannot get it to go back inside any more, you need to see your doctor soon. If in addition the swelling becomes painful, you need medical advice urgently if necessary go straight to the hospital accident department, day or night.